Enjoy your day in the heart of Puerto Vallarta, relaxing along-side the Rio Cuale and overlooking the Pacific ocean! Come take a tour of our in-house tequila distillery and taste our variety of tequilas! Here at the distillery you will be given more insight into the process of making tequila, and even how best to drink it! But to get you started… Tequila is made from the distillation of the juice from the blue agave plant. Pure tequila, made solely from the agave plant, begins its life in fermentation vessels. Silver tequila, sometimes referred to as blanco, is rarely aged more than a couple of weeks, making it the purest form of tequila. It is often considered the best type of tequila to use in mixed drinks, and is commonly seen in margaritas. Añejo tequilas are aged from one to three years, and are considered the best type of tequila for sipping because of their smoother flavor. Añejo means “vintage”, and they are darker than reposado tequilas. Reposado means “rested” in Spanish, and reposados rest anywhere from two months to a year before they are bottled. Reposados take on the gold hue from the barrels in which they are aged. They are typically aged in oak or white oak barrels, and the type of barrel changes the flavor of each distillery’s tequila. Extra or ultra añejo tequilas are aged for over three years. This is a relatively new type of tequila, which got its official classification in 2005. This type of tequila is the most expensive, not only because the flavor is improved with age, but also because distilleries will only allow their best spirits to age for so long. Extra añejo tequila should be enjoyed, not shot or mixed. Most gold tequilas get their color from the caramel coloring added to the tequila before fermentation. Watch out for brands that don’t cite “100% agave”, as those brands have added coloring and sugar to obtain the gold color. Gold tequilas are not typically aged, and usually contain only about 51% agave tequila. Sometimes 100% agave gold tequila is made by combining silver tequila and an aged tequila, such as reposado or añejo. 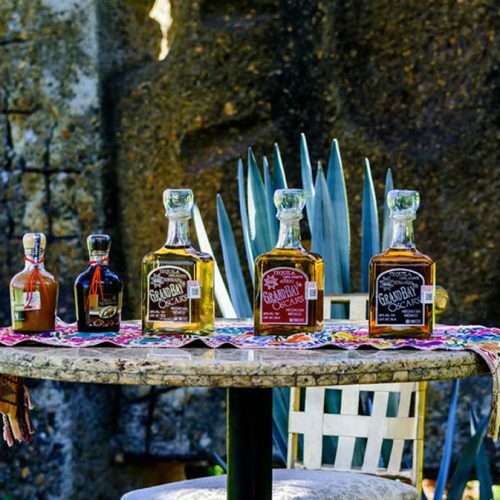 Since quality aged tequila has a gold hue, the addition of the coloring was a marketing tactic to improve one’s perspective of cheaper brands. What types of Tequila will you find here at Oscar’s in-house distillery? • Tour hours: 9:00am – 6:00pm, 7 days a week! • Tours and Tastings are on the house! All of our Tequilas are available for retail purchase and can be packaged on-sight, at time of purchase, for a safe journey home! Please feel free to book in advance for large groups and inquire regarding private events!